Since 2010 export sales have become an increasingly important contributor to Metal Finish Equipment & Supply Company’s overall sales of MetFin Shotblast Systems blast cleaning and peening systems. Last year alone, export sales accounted for nearly 50% of total revenue. And we are not just selling to small manufacturers, but to large corporations: Alstom Power, Case New Holland (Fiat) and most recently Tubacex Group SA. These industry giants have signed significant contracts for the delivery of MetFin Shotblast Systems surface preparation equipment. 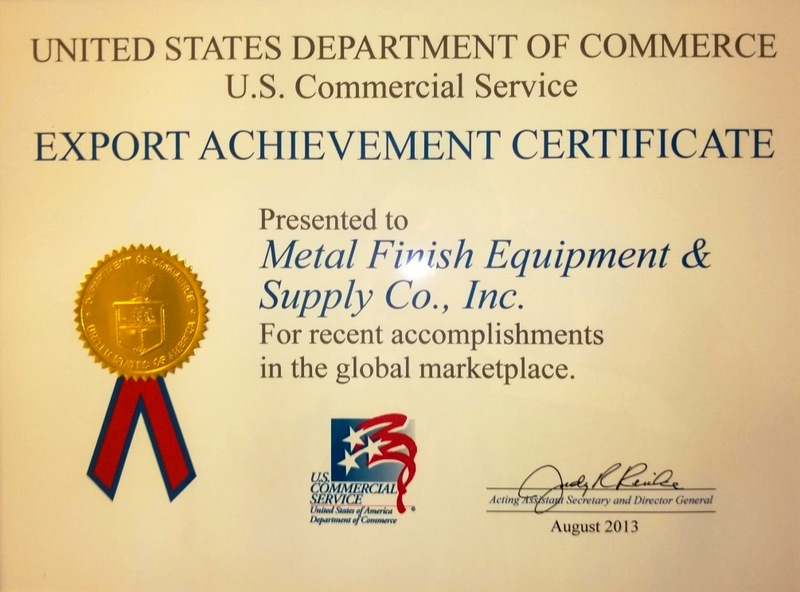 In recognition of Metal Finish Equipment & Supply Company’s success in targeting and winning export business, the Connecticut office of the US Department of Commerce along with US Congressmen Joe Courtney nominated MetFin for the Export Achievement Award. On August 27, 2013 Congressmen Courtney and U.S. Department of Commerce District Director Anne Evans visited MetFin to present the award. How does a small manufacturer of specialty industrial machinery in Suffield, Connecticut compete for business in the global market? The internet has been an important tool in exposing our business to foreign buyers. While the webpage brings potential buyers to our site, we believe it’s the world view of US Trade that often helps seal the deal. Once MetFin has proven that our equipment is of exceptional quality, buyers then take into consideration what it means to do business with a US based company: US companies have a reputation for producing high quality products; are trusted in commercial transactions; and have business ethics that are beyond compare. It is this combination of superior product and positive world view of trade with US companies that ultimately influences customers to purchase from small companies like MetFin. Each MetFin machine put into service in a foreign facility offers our company the opportunity to expand and strengthen our reputation as a competitively priced manufacturer of high quality surface preparation equipment. The whole MetFin team contributes to that reputation: from design, engineering, production, fabrication, assembly, logistics, installation to service and support, the pride our staff displays each day directly impacts MetFin’s reputation. The MetFin team accepts the Export Achievement Award from Congressman Courtney for outstanding growth in export trade. 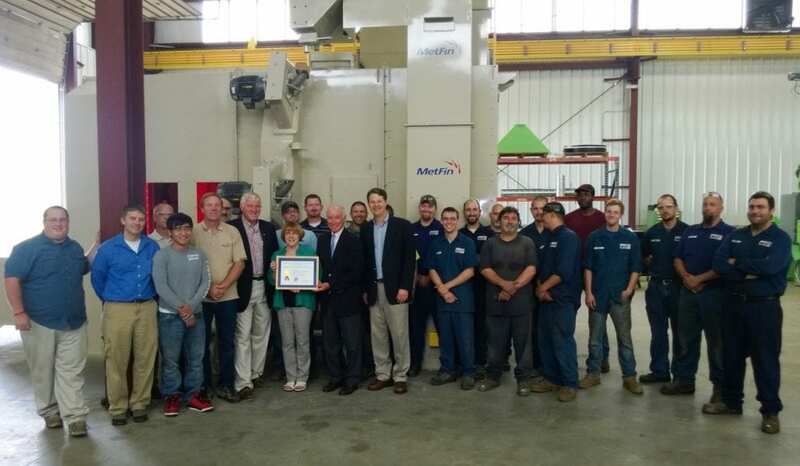 We are grateful to Congressmen Courtney for recognizing Metal Finish Equipment’s great strides into the international trade market with this award. We would also like to thank Anne Evens from the United States Department of Commerce International Trade Administration for offering resources needed to assist MetFin expand our export business. MetFin’s sales go beyond national borders.